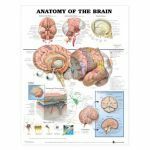 LFA #99976 Chart - Understanding Alzheimer's Disease. 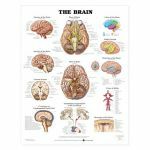 Defines Alzheimers Disease (AD) and discusses the aging brain, dementia and diagnosing AD. 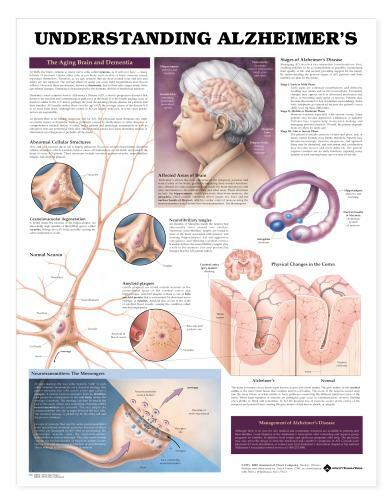 Lists risk factors and describes the 3 main stages of Alzheimers Disease. Provides key management techniques for both the patients and their families and caregivers. Illustrates and discusses the areas of the brain affected by the disease, amyloid plaques (also called senile plaques) and physical changes to the cerebral cortex. 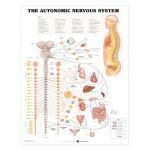 Shows and describes the abnormal cellular structures involved (granulovacuolar degeneration and neurofibrillary tangles) and how AD destroys how neuron talk to each other. 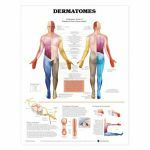 Each chart's size is 20" W by 26" H.
All LFA Charts and Posters are designed to a) Provide just the right level of detail, b) At-a-glance format, c) Striking colorful images, d) Enlarged view of key organs or structures, e) Comprehensive and anatomically/medically accurate.Plastic laminate, 20" x 26" offers flexibility, durability and attractive appearance for medical professionals, patients, students and other specialists. Complete with metal eyelets at top cornors for hanging or portable stand display. "Write-on, wipe-off" surface is perfect for classrooms and professional offices.Shipped in mailing tube. Note: Many charts and posters also available in Spanish (-SP) to meet the needs of an expanding Spanish-language population and for improved communication.